Day 4 began with uncertain expectations, returning five players with big blinds and bigger stacks, no one was sure how it would turn out. 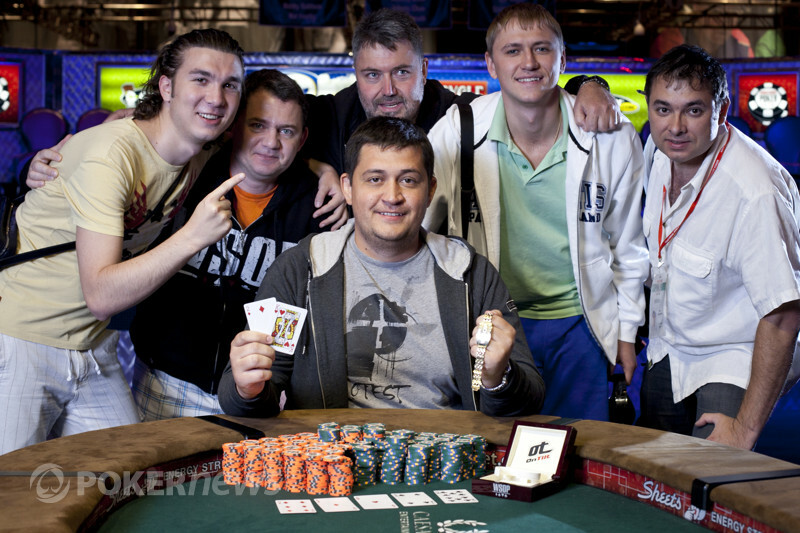 After only one and half levels it was Mikhail Lakhitov that would be the last man standing with a new piece of jewelry. At the start of play the five players were very conservative, mostly taking turns stealing the blinds and antes. But it would be Eddy Sabat that was the first to go. Sabat was crippled against Thomas Miller when his failed to outrun . He was left with less than one big blind and was knocked out the next hand by Thomas Middleton. Miller was the next to go when his couldn't run down Mikhail Lakhitov's pocket queens. 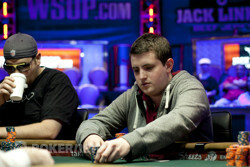 Three handed play didn't last long after Middleton lost most of his chips to Hassan Babajane. Then Babajane lost them to Lakhitov, giving the Russian a mighty chip lead. Middleton was out in third place when his pocket tens were bested by Lakhitov's . Middleton's rail was much more subdued than last night, most of them looking worse for the wear. Heads up play only lasted a few hands with Lakhitov having a 9,000,000 chip lead. Lakhitov moved all in preflop and Babajane called. The board ran dry for both players and Lakhitov's king high was good enough. Day 4 was clearly Lakhitov's day, virtually never dipping below the stack he came in with, and scoring all but one knockout. Only a few hands of heads up play were needed to crown a bracelet winner. Mikhail Lakhitov moved all in from the button and Hassan Babajane called. They went to a showdown for the bracelet. After Babajane failed to make a flush Lakhitov's hand held and Babajane was eliminated in second place. 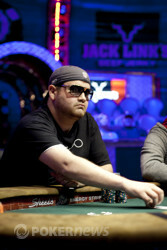 Mikhail Lakhitov and Thomas Middleton got it all in preflop and MIddleton was in danger of busting. Lakhitov tabled and Middleton held . The board ran and Lakhitov earned the knockout by pairing his king. 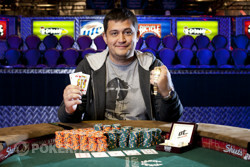 Hassan Babajane made it 275,000 on the button and Mikhail Lakhitov called from the big blind. The flop came , Lakhitov checked and Babajane moved all in. Lakhitov called and tabled for a flopped set and Babajane held . The board finished and Lakhitov gained the chip lead. Thomas Middleton made it 250,000 to go from the button and Hassan Babajane called from the big blind. The flop came and Babajane check-called 300,000 from Middleton. Both players checked the turn and the fell on the river. Babajane bet out 600,000 and after some thought Middleton called. Babajane tabled for a flopped full house and Middleton mucked. Mikhail Lakhitov raised to 200,000 from the button and Hassan Babajane moved all in from the small blind. Lakhitov called and tabled , having Babajane's dominated. The board ran and Babajane doubled up after pairing his deuce.